The Aero Research "Snark." High Gross-Tare Weight Ratio. TO the design of Dr. N. A. de Bruyne, Aero Research, Ltd., of The Aerodrome, Newmarket Road, Cambridge, has constructed an interesting wooden cantilever monoplane ДальшеMore>>> to seat four persons. Powered with a "Gipsy Major" engine of 130 h.p., the aircraft was flown last week for the first time by its designer, who reports that it handled well and landed at a very low speed. Bad visibility made it impossible to obtain accurate data, but the top speed appeared to be about 120 m.p.h. 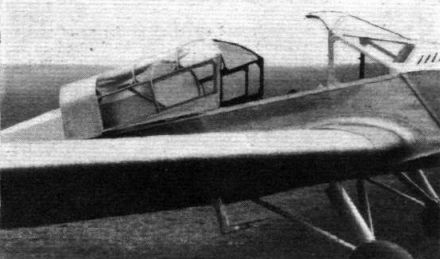 The "Snark," to give the machine its name of somewhat cryptic derivation, was designed for the personal use of Dr. de Bruyne, who required an economical low-wing cantilever monoplane with folding wings in which a low wing-loading was reconciled to a good ratio of gross to tare weight. After three years of research the company believes that these requirements have duly been met, as the tare weight of the "Snark" is 1,180 lb., and the gross weight (which may be increased later without alteration in structure weight) is 2,200 lb. This gives a wing loading, based on full load, of 9.6 lb./sq. ft. Although apparently conventional in design, the wing, which is covered with plywood, is believed by the designer to be the first of its type to have been stressed analytically. Within the wing, the trailing edges of which are swept forward, are luggage compartments, situated over the C.G. of the machine, and further outboard are tanks tor thirty-two gallons cl petrol. Thus, it is claimed, the loads are well distributed. The pilot and one passenger sit over the front spar, and the remaining two passengers are seated over the rear spar. Differential ailerons are fitted, with their operating mechanism (which embodies neither cranks nor chains) enclosed within the wing. The empennage is of cantilever construction. A very large amount of work has been done by the company on the stressing of plywood-covered fuselages, one of which is employed for the "Snark." Another example, incidentally, has been purchased by the Air Ministry and has passed all its tests satisfactorily. Dual controls are fitted, embodying duplicated rudder pedals and a central control column incorporating a ''flop over" device. The elevator control wires run straight from the control column to the elevators, and are entirely enclosed within the fuselage. It is possible to remove the front flooring of the cockpit to expose the control mechanism, and there is a large inspection opening behind the rear spar. Each half of the nine-foot-wide undercarriage, which is of the company's own construction, has but one moving part. Brakes are fitted, and are operated by a centrally mounted column. When the brakes are "on" the elevators are automatically locked in the "up" position. FOUR seats, and a range of 500 miles, is a good performance with a "Gipsy Major" when the cruising speed is 112 m.p.h. The "Snark," designed by Dr. N. de Bruyne, of Aero Research, Ltd... Cambridge, is capable of achieving these figures, and it is probable that after further tests the all-up weight will be increased. Even at its present figure the ratio of gross weight to tare weight is as high as 1.82, which means that the machine, although a comparatively small wooden cantilever monoplane, carries 82 per cent, of its gross weight - an unusually high figure for this class of machine. This has been achieved, as was explained in Flight of December 27, 1934, by the evolution of a system of stressing which takes into full account that proportion of the stress carried by the plywood skin, both of the fuselage and the wings. The “Snark” embodies a number of very interesting points, quite apart from its main structural features. The control column is of the jointed type, so that the top can be swung over to allow either front passenger to fly the machine. On the rear of the top of this column is another small handle which operates the brakes; a sideways motion brakes either wheel for taxiing, while pulling backwards puts on both brakes together. This last point is valuable, in that it ensures raising the elevators at the same time that the brakes are applied. This brake lever can also be locked in the fully-on position for parking, locking the elevators at the same time; and, as the ailerons are operated by an irreversible link motion, the machine is then in a suitable state to be left unattended. WEIGHTS:- Weight empty (excluding upholstery). 1,180 lb. ; all-up weight, 2,200 lb. ; wing-loading, 9.3 lb./sq. ft.; power loading, 16.9 lb./h.p. ; weight/span, 1.24 lb./sq. ft.
AREAS (sq. ft.):- Wing, 216.4; ailerons, 21.6; tailplane, 16.4; elevators, 10.4; rudder, 6.6; fin, 6.7. PERFORMANCE (estimated):- max. speed, 120 m.p.h. ; cruising speed, 112 m.p.h. ; landing speed, 40 m.p.h. ; initial rate of climb, 600 ft./min. ; ceiling, 15,500 ft.; range, 500 miles. 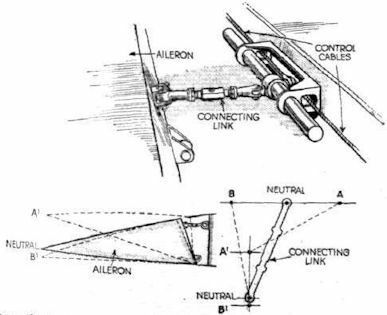 The Operation of the "Swing-over" Column on the "Snark"
OF unusual interest, the control system developed for the de Bruyne ''Snark'' deserves detail description. The machine itself was described in Flight for December 27, 1934, and February 14 this year. The drawings given above are diagrammatic in that they do not show the actual details of the system, but merely indicate the method by which the results are achieved. Fig. 1 is a side view of the control column, showing the bottom pivot and the connections to the ailerons. Fig. 2 is a view of the column looking aft; it explains the method whereby aileron control is obtained by hinging the top part of the column only and by arranging for that part to have its neutral position at an angle; i.e., it gives a neutral position on each side, so that either person in the front seats can take control. Fig. 3 is a similar view looking forward and shows the secondary lever by which the wheel-brakes are applied - differentially by a sideways movement and "both on" by a straight pull backwards. Fig. 4 shows how this brake lever is locked by a catch for holding both wheel brakes "on" when parking the machine; this method has the added attraction that locking locks the elevators up. The remaining drawing explains the method of operating the ailerons. By altering the length of the link and the relative positions of the centres, any combination of movement can be obtained. Mr. de Bruyne has primarily built the “Snark” for experimental purposes, so the results he obtains will be followed with the greatest interest. It is understood that his firm, Aero Research, Ltd., is shortly to move to an aerodrome which has been acquired by the company at Duxford, within a mile or so of the Royal Air Force aerodrome of that name. The "Snark," photographed on Marshall's aerodrome at Cambridge. The cabin top is hinged on radius rods, which lift it as it is moved back; the difficulties of sliding the roof in grooves are thus avoided. BUILT TO AN IDEAL: The Cambridge Aero Research "Snark." These sketches, which are purely diagrammatic, indicate the operation of the De Bruyne system; they should be studied in conjunction with the text. The method of operating the ailerons, shown diagrammatically.